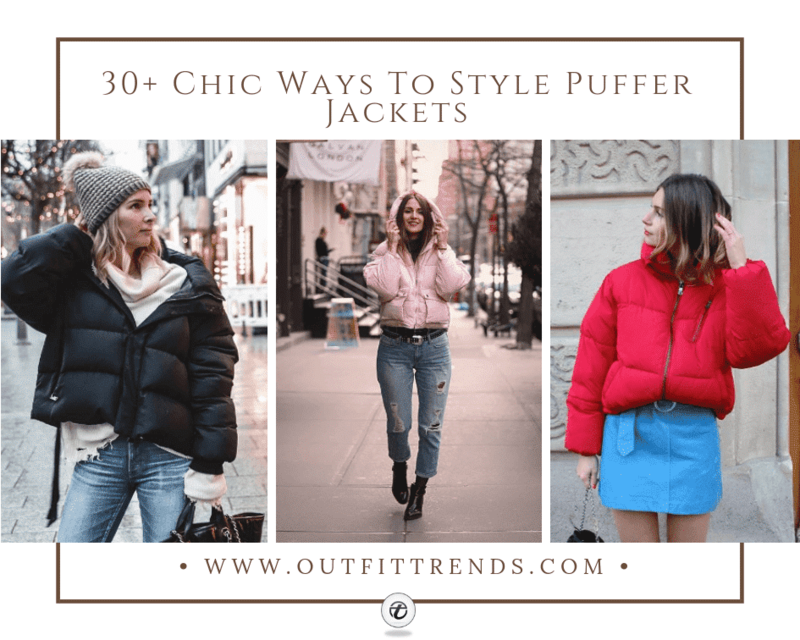 How to Wear Puffer Jackets For Women? Oh, the weather outside is frightful, but that doesn’t mean we can’t continue to look delightful (ly fashionable). Even when its bone-chilling cold with temperatures in the teens (bbbrrrr), many ladies really don’t want to skip fashion for warmth. Here are more than two dozen ways to brave the elements this winter and remain super stylish while wearing a puffer jacket. ↓ 31. Go for the gold! The Skyler down-filled bomber jacket by Sam-NYC is crafted from a densely woven nylon. The surface has been treated to obtain a lacquered look. It is lightweight, yet protective of wind and water, and filled with goose down to achieve the warmth and an ultra-soft feel. The jacket features a racoon fur trimmed hood, centre front zip closure with snap placket, 2 lower pockets, a knit waistband, and spandex thumbhole cuffs. This pretty little number will cost you a suggested retail price of $695.00. If you’re into bomber jackets, have a look at these 21 Best Leather Bomber Jacket Outfits for Women. You can never go wrong in a neutral monochromatic coat, especially one that comes from H&M for as little as $124. Pair with asos high waist jeans, Nike air max thea sneakers, a.p.c geneve bag, and who what wear collection top. You’ll look like a million bucks while barely even trying. And have money left over to splurge on guilty little pleasures, like lattes, all month long. How cool were the 1980’s?! Channelling Madonna, Cyndi Lauper, Boy George & Culture Club. Life would be so much better if neon pink could reappear in every decade! This jacket brights up your complexion and turns you into a ray of sunshine. The best part is, it’ll be super easy to identify which coat is yours at the end of the night. Sometimes we just need a break from basic black. Michael Kors understands this and offers this winter coat in rich jewelled hues which can easily be matched to your amethyst and emeralds. Treat yourself to a matching mani too! You’ll sparkle like the precious gem you are. ↓ 27. Go big or go home! Stay toasty warm from head to toe. This belted “puffy compilation” from Imgur lets you flaunt your tiny waist and not look like a big shapeless blimb. Dress it up with pumps, boots with a kitten heel or keep your feet planted firmly on the ground in a pair of Uggs or fashionable kicks. The colour blue is having a moment in home décor. Pinterest boards full of cobalt blue kitchens. Fashion follows the interior design. Step out looking boho chic in this warm 90% duck down warm parka quilted coat. Best part if the removable scarf. On sale for only $125.55 at Boho Gipsy Store. For those cold, raw days when you really wish you could stay under your duvet covers, throw on this stunning coat from Add. Changing out of your oh so comfy pyjamas is optional. Let them question if you’re part of the royal family in this majestic purple hooded winter white duck down jacket with natural fox fur collar. It’s even available in plus sizes. They will be shocked if you tell them it’s only $217.27 at AliExpress. Wish your closet could be filled with Balenciaga, but worried if you can even afford this month’s rent payment? The Orolay is the thickened $100 down jacket that looks a little bit Balenciaga, a little bit Sacai, and is selling like hotcakes. I spotted three women checking into spin class on the upper east side of Manhattan, New York City this morning. Snag it for only $99 (was $250, now 60% off) at Amazon. C’mon, admit it, what girl doesn’t go crazy when they realize their dress has actual pockets?!? The H-line Casual Pockets Hoodie Coat offers front pockets. What a score! Gloves optional. Did we mention this jacket has front pockets?!? Ward away from the evil eye and make sure everyone is watching you closely while prancing through the streets in this very noticeable puffer from Rivaynyc.com | Rivay® Official. Pairs nicely with a classic Chanel bag. The girl who wears this is certainly an “It Girl” wanting to be viewed, admired, appreciated and remembered. Puffer jackets are the perfect way to winterize athleisure, which continues to be so in style right now. This Aritzia super puff jacket comes in so many different colours options. The key to styling the perfect puffer jacket is to get one that is slightly cropped because it emphasizes your waistline and creates a feminine silhouette. For more ideas on work out clothes, check out these 10 Super Cool Gym Outfits for Women. Easily a perfect jacket to throw on before a girl’s wine night out or meeting friends at the pub. Pairs well with black pants and heels. It’s practical and unfussy, even if you’re not. Strut yourself in a big bold emerald green jacket and skinny black stirrups. It’s almost possible to feel the heat radiating off of this classy lady. This seriously could be Meaghan Markle in her pre-Dutchess days. Do you see the resemblance? The long puffer is a must-have staple in every female’s closet. It protects you all around, exposing only a tiny portion of your legs. Keep that part of your legs covered in heavy tights or thick wool pants. There’s no better option for those living in a city with lots of precipitation and/or low temperatures. Feel free to take a bold chance on your shoes and accessories since the majority of your body will be covered up the coat. Puffer coat + cropped jeans + ankle boots equals a winning equation every time. Now you do the math. Glossy magazines will never be completely out of Vogue. There’s something so rich, luxurious, eye-catching and worthy of shine and that definitely includes shiny nylon down jackets. This is a bespoke shiny/PVC/vinyl down winter coat which is made of high-quality 4-way stretch vinyl. It has an oil slick look with really smooth touch (latex imitation). In a class by itself and not your usual nylon puffer. You may think it looks familiar because it mimics the Moncler style, but is much more glossy. An eccentric design could really polish a plain, boring coat. Gigi Hadid provides us with some awesome tips with this bold, sassy and comfy puffer coat. Remember that you don’t have to put too much effort with your other clothing because the coat itself can do the magic. Just like that, you can look effortlessly chic. Patterns can be risky, but there’s just something so beautiful and unique about this White Floral Turtleneck Long Sleeve Coat. Definitely meant for the confident fashionista who wants to stand out from the crowd and differ from the masses all huddled together in their basic, boring, black winter gear. This short camo puffer jacket from Denim & Supply Ralph Lauren Down Snorkel Jacket is guaranteed to keep you toasty warm. It’s also available in a men’s version if you want to twin with your mate. Requires nothing more than a chic pair of jeans and rugged combat boots. Spend less time getting ready and much more time having fun. For a statement-making look, you can even pair this jacket with Camo Pants. Puffer jackets with a slim silhouette like this blush pink renew lightweight puffer jacket prove to be endlessly versatile. Simply toss it on over workout gear on your way to or from the gym, or style it with a sweater and your favourite jeans for the perfect, low-key weekend look. The mock neck collar complements so many different layers, from turtlenecks, to crewneck shirts, to button downs, to hooded sweatshirts. Add a little extra warmth on cooler days by wearing it over a simple cashmere sweater. Pure perfection. 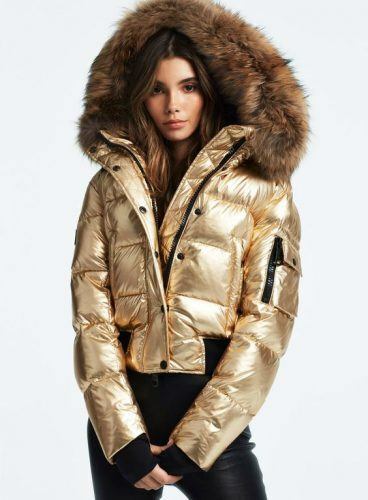 This two-tone puffer is so attractive and easy on the eye. Roll up the sleeves for an extra pop of colour. I can’t help but wonder if it’s reversible. That would mean two fabulous coats for the price of one! You should also have a look at these 20 Ways to Wear Long Coats This Winter. Talking about the reversible puffer jacket, Gigi Hadid’s look is simply winter goals. Mid-length jackets can be worn by any type of individuals, whether you are a plus size or a petite woman. The length still keeps the whole ensemble more flattering because it provides a complimentary balance. She looks put together in a pair of black leggings, big handbag and eye-catchy boots. Puffer coats with belts are really attractive and convenient. You can manipulate the comfort and style level by adjusting the belt. This accessory promises that you will never have a hard time finding the perfect fit because the coat itself is adjustable. Zippers and belts are a fantastic combination to lay emphasis on your body. From the upper to the bottom, you can certainly affirm that this girl knows how to style a cropped puffer jacket. The design of the top and the colors of the cropped puffer jacket perfectly mesh together. And oh, the flare long jeans were an ideal match to the mini short puffer jacket. Plaid is always current. Bring it out for hayrides and bonfires in the crisp fall weather. Add a red or green scarf for a true festive holiday feel in December. Rest assured, you don’t look like a lumberjack. But you may just get picked up by one. Love plaid? Then don’t miss out these 18 cute Outfits with Plaid Coats that will make you want to buy one asap. ↓ 4. Got a Problem with the Paparazzi? Hmmm, is it possible that the puffer coat has made its comeback courtesy of celebs being spotted in them right before stripping off for red carpet event to get photographed in their revealing dresses? Or, because it’s this jacket they choose to wear when running errands in cold temperatures and hiding from the paparazzi? Well… they’re obviously wearing them for style reasons. What if I told you all you all need is a great pair of shades to compliment your puffer coat. So stick your chest out a bit more and stay incognito hidden behind a great pair of sunglasses that flatter your face. Better days are coming. They’re called spring and summer. Let winter know you are breaking up with him. Show him, it’s not you, but I’m gravitating towards warmer weather filled with lilacs and pretty flowers. If you can afford it, go above the budget and treat yourself to a timeless and classic beauty such as Moncler, Canada Goose, etc. Be vigilant about taking extra good care of it and plan to pass it along to your daughter once she’s grown into it. Because when your daughter covets your clothing, you know you’re a super cool mom! Now if only she could give you her perfect skin. Bundle up, stay warm and have the best winter ever!